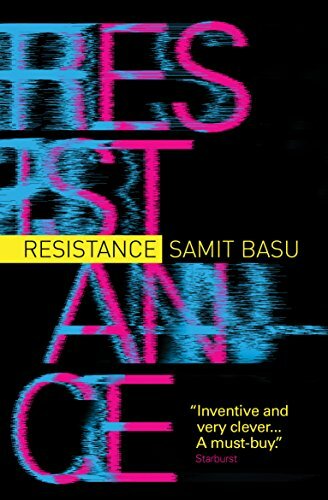 The sequel to Samit Basu's Turbulence (2012), Resistance , much like its preceding volume, is a post-modern, comedic, smart romp through superhero storylines and tropes. To recap: in Turbulence , the passengers of Flight BA142 from London to Delhi all gained superpowers that reflected, in some way, their innermost desires. Accidental superhero protagonists include actress-wannabe Uzma, who gained the power of making everyone want to do as she Says. There's also Aman Sen, a computer geek, who was given the power to use his brain to interface with the entire Internet. And Vic, a starry-eyed patriotic soldier, becomes essentially Superman, minus the leotard. By the time Resistance takes place, the world has gained more superpowered people ("supers" for short). The world, and its normal citizens, is not prepared. Aside from property damage—world monuments are being leveled and rebuilt on a weekly basis—there's collateral damage. Which is to say, sometimes innocent people die when supers get involved. Which can lead to anger directed at supers. Resistance 's more-or-less primary antagonist is Norio, a Japanese businessman with a Batman origin story and Tony Stark industrialist trappings. His parents were killed by the Unit—the United Nations Interception Team, a superhero group comprising the Turbulence crew plus a smattering of new faces. So when supers start dying all over the world, the Unit immediately suspects Norio. However, Norio is only one of the Unit's numerous problems. One bigger bad is Utopic, a shadowy megacorp whose goal is ostensibly to make it possible for humans and supers to live in harmony. But in secret, it often captures supers and experiments on them, presumably without their consent. Another shadow on the horizon is Kalki, a baby who became a god during the events of Turbulence . Kalki, now eleven, is a god-like being who can grant wishes and warp reality with his mind. And most of the antagonists aren't exactly working in concert. And as the cherry on top, every psychic super on the planet says the world's going to end in three weeks. Without specifying how. The book is populated by a large cast of superheroes, written with amazing finesse—Basu's protagonists, antagonists, and even side characters are engaging when they're being badass, laugh-out-loud funny when they're being snarky, and heartbreaking when they're dying. The plot roars along, and in between fighting preteen gods and killer insects, Basu fills out the cast with clever post-modern supers, such as That Guy (as in "who's that guy?") whose power is to appear in any photograph, or party, or important list. And there's Viral, whose power is to shout advertisements in capslock to the entire world. Another plus: as the named characters indicate, Resistance is very focused on South Asian characters, with a smattering of East Asians. As a Chinese person who primarily reads Anglophone works, I appreciated this—why shouldn't the entire world get wish fulfillment fantasies? No reason at all! And Basu goes on to refine the point: "[The] marketing team had informed [Uzma] that the Unit was too South Asian and they needed to get an all-American type in there quickly, preferably as leader." The Unit's response was to hire "Wingman," a "craggily handsome" statesider with "all-encompassing positivity" (p. 47). Wingman doesn't get all that much screentime, and although he's usually on the scene, being presumably competent, he's exactly what it says on the tin: the support to Uzma et al, who are still truly running the show. This is astounding in a genre where Marvel and DC still dominate. Much like its predecessor, Resistance is chock-full of pop culture references. The full list is too long to list, much less analyze here, but two in particular stand out: Guillermo Del Toro's Pacific Rim (2013) and Hideki Anno's Shin Seiki Evangelion / Neon Genesis Evangelion (1995). In firm keeping with these books as focusing on characters and authors not from whitebread environments, this was fitting. And more than that, the references were interesting and thoughtful. Kaiju and mecha are delightfully invoked starting on page one, when a giant lobster kaiju pops out of the ocean and "does what every kaiju must," that is, attempt to level Tokyo. Norio's crack team of anonymous mecha pilots, ARMOR ("Advanced Robot for Monster Onslaught Resistance"), quickly jump into action, slaying the monster. There's some ribbing at the SFX and poor physics involved in kaiju, but it's entirely affectionate. "You think of it as a disease," says Azusa. "But the world thinks of it as evolution" (p. 97). Furthermore, Azusa believe that this form of evolution is not only acceptable, but a positive force: "The supers aren't just an improvement themselves, Norio, they're helping us grow as well. If that isn't evolution, what is?" (p. 98). What Azusa misses is that evolution can be both a constructive and destructive force. Even if supers are good people doing good things, that doesn't mean they will ultimately benefit all humanity. In contrast to Azusa, Utopic grasps this point, and has concluded that the world as we know it needs to be destroyed and rebuilt, if it is to survive the existence of supers. Many people will die, but that's still preferable to total annihilation. Compare this with Evangelion , which features mechas, kaiju in the form of "angels," supernatural super-humans, and a shadowy organization dedicated to "evolving" humans, by way of inducing an apocalypse on Earth. Both narratives avoid chaotic-evil villains who enjoy massacring humans, instead opting for antagonists who are, albeit in irredeemably horrific ways, genuinely attempting to preserve humanity in the face of enormous odds. Both works raise probing questions about the price of human survival, in between all the power-beams and mecha-suits: Is it better to focus resources on saving people from a threat, or on searching for a solution to the threat? Is there a point to fighting evolution or nature? How much should the human race sacrifice in the name of existence? Whom should we allow to make these decisions? Resistance , however, never seriously tries to answer these questions. This is my only complaint about the book: it is a smart but casual narrative, and its constant raising of complex issues that it then dodges frustrated me. I don't look down on "popcorn entertainment." I loved Pacific Rim , in part because it made no pretensions to be anything other than a gorgeous movie with big machines punching giant monsters. Basu isn't a debut writer, yet I wonder if this is a manifestation of writerly insecurity—raising these questions because he feels like he has to make intellectual gestures, instead of being confident that his story does not require these trimmings. In this way, sometimes Basu's own cleverness detracts from the focus of his book. But even my criticism sums up to actually wishing that the author would get back to the pyrotechnics, the wisecracks, the superhumans with human flaws, and the weird and wonderful powers that abound in this world. I'm highly looking forward to the next book in the series, and I've already got my popcorn at the ready. Z. Irene Ying is a research scientist and science writer. She blogs about the science in pop culture (and every so often, the science in real life) at Aperture Science Journal Club.